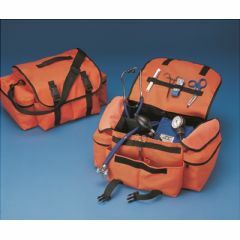 Plenty of room for essential gear needs with overall size of 15" x 9" x 7"
HW Cordura nylon 3-section central compartment with a zip-flap storage pocket & tool loops, 2 zippered side pouches, 2 front pouches & tool loops. Top handle Adjustable shoulder strap with quick-release buckle & hook-and-loop fastener(s) closures. Reflective Star of Life emblem. This is a Rescue Response Bag only. Does not include any other products such as first aid kits or emergency supplies. I called yesterday and spoke with Laurie, a most professional person! She contacted the shipping dept. and in a few minutes assured me the shipment were to be delivered tomorrow. May I point out that are employees like Laurie that make a big difference among competing businesses. Just wanted you to know that you service was exceptional. I placed my order on Wednesday and received it the next day!